Broadly speaking, a "business incubator" is a company whose purpose is to assist start-up companies in their development process by providing basic services such as management training and office space. In contrast, a "business accelerator" compresses the development time scale and aims to turn business ideas into prototypes that are market-ready in a matter of months. In addition, the "accelerator" provides initial funding in return for an equity stake in the new business, a model not dissimilar from the popular primetime show "Shark Tank." For example, Y Combinator ("YC") is one of the leading business accelerators in the world. YC interviews and selects two batches of companies every year, and provides a three (3) month training program and seed money in exchange for 7% percent equity in the start-up company. Overall, the goal of a business accelerator like YC is to provide initial funding quickly when dollars are at a premium during a company's infancy. This investment is intended to result in an "exit", i.e. an independent, self-sustaining company that will provide YC with a return on its investment based on YC's retained equity percentage. For a start-up company, a business accelerator can be invaluable because it provides the necessary funds to get the company "off the ground." Typically, the largest cost for a start-up is payroll; the people with the best ideas will look for the best compensation. As such, the key personnel, and the dollars necessary to keep them around, may be the most expensive, and, simultaneously, the most important aspect of the early days of a start-up company. The Advantages of the R&D Tax Credit for "Business Accelerators"
Applying for a business accelerator program is a major decision for a company in its infancy, regardless of the industry. When evaluating growth stimuli, a start-up should be aware of the advantages of working with a business accelerator. For example, the most apparent benefit of the business accelerator type of program is the built-in networking opportunities with mentors, advisors, and alumni, companies who have gone through the process previously. Often, being able to access the wealth of knowledge and experience that these companies have generated allows the fledgling company to not have to "re-invent the wheel" on basic functions and instead focus on developing unique aspects of its own business. Additionally, peer companies in the same accelerators provide motivation and morale boosting since everyone is working hard to achieve goals. This environment provides healthy competition and allows the developing businesses to visualize high and low points encountered by themselves and others throughout the process. Further, certain accelerator programs are extremely selective, admitting a minimal percentage of total applicants. When outside investors see a well-recognized accelerator as a line-item on the business' resume, it distinguishes that start-up from others in the industry. 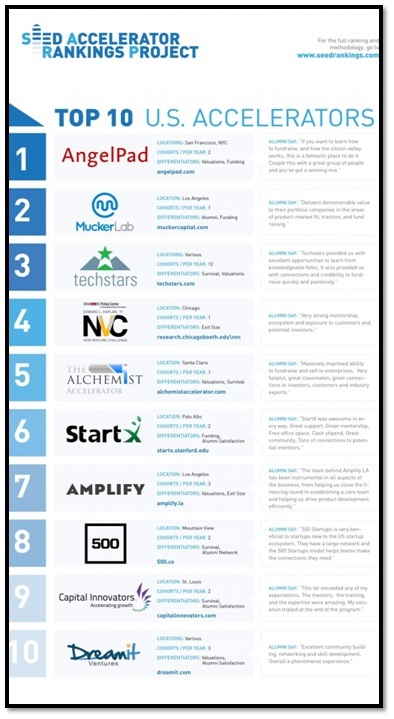 The current "Top Ten" domestic business accelerator programs are illustrated in Table 1. Eligible costs include employee wages, cost of supplies, cost of testing, contract research expenses, and costs associated with developing a patent. On December 18, 2015, President Obama signed the Protecting Americans from Tax Hikes (PATH) Act making the R&D Tax Credit permanent. Furthermore, in this latest iteration of the R&D Tax Credit, Congress continued the legislative trend to incentivize American businesses, particularly tech oriented start-ups. Specifically, the new provisions of the PATH Act provide start-up companies with the ability to take a payroll tax credit, even without incurring actual tax liability. Beginning in 2016, the R&D credit can be used to offset Alternative Minimum tax and start-up businesses can utilize the credit against payroll taxes. The new payroll tax credit aspect of the R&D Credit will significantly benefit many start-ups and small to mid-sized businesses. Specifically, the R&D Credit has now been expanded to apply credits in excess of income taxes to FICA tax liability. Notably, even if a company was unprofitable and had no tax liability, the credit can be taken against payroll taxes for start-up businesses with less than $5,000,000 in gross receipts. This offset is capped at $250,000 per year, over a five year period. As such, the R&D Tax Credit now allows this payroll tax to be taken directly against FICA taxes, and does not require general income tax liability for the company to utilize the credit amounts. The company will realize significant tax benefits regardless of not generating a profit. Most importantly, this credit directly affects the payroll amounts incurred by the start-up. Typically, the largest cost for a start-up is payroll; the people with the best ideas will look for the best compensation. As such, the key personnel, and the dollars necessary to keep them around, are usually the most expensive line item in a start-up's P&L accounting balances. Start-up companies have a tenuous grasp on existence at their outset and must consider all options available to them to remain in operation. While business accelerators are, and will continue to be, excellent opportunities for start-ups to take advantage of, a shrewd business operator, imbued with entrepreneurial spirit, should also take advantage of the R&D Tax Credit benefits designed for start-ups. The payroll R&D Tax Credit is a permanent credit allowing for internal management of financial resources and increase in capital flow. Essentially, the credit serves the financial function, and, arguably, the primary benefit, offered by a business accelerator, but does not infringe on the start-up's autonomy. An extra $250,000 in annual tax benefits would be readily welcomed by any start-up.